This is danceable swing jazz with hot vocals, plus a ballad or two, and a waltz. "Suddenly I feel like dancing! Sounds terrific!" 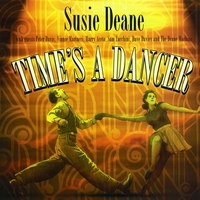 "Listened to it over and over..."
"Time's A Dancer is a lovely jazz album, Deane is a real star!" "Time's a Dancer is terrific! Very well produced and performed; Susie has a clear, vivacious, and enjoyable voice. Not a dull moment on the entire album. This is becoming one of my favorite albums." "It's a long-awaited wonderful CD, lives up to its promise!" "I got the CD on Monday and have listened to it constantly. I love it!" "I'm lovin' the CD... terrific vocals and especially love your phrasings... Enjoying those other musicians, too. You are now on my iPod!" "I love the CD! Haven't stopped listening since it arrived....just makes me want to DANCE!!!" "Time's a Dancer is a constant in our car CD player. We love it! "We kitchen-danced for the first time in years! Loved the scats. Such freedom in your voice. The band's great."